A couple of days ago I agreed to meet Larry and Meg at the rappel site on the blufftop above Acid Beach Cove, hoping to continue our exploration of this incredible area. Having already photographed from sea level all of “The Seven Sisters,” as I’ve dubbed the cluster of Sea Arches here, we had another goal in mind this time, reaching “The Notch.” This small cove, entirely cut off from land access by sheer 150 foot cliffs and arch-punctuated promontories on either end, is the last stretch of untrodden beach, by us, at least, in this section. Having previously discovered that even at the lowest of tides, and with a willingness to wade (hiking in was impossible), we needed a better plan. We thought we had one this time, that being, after climbing down, wetsuiting up, and donning lifevests, we would boogieboard around the Acid Beach Arch north to the cove. While waiting for my friends to arrive, I had done some bushwhacking, finally locating a way to get through the poison oak to a point above “The Notch,” from where I could take some pictures. I wouldn’t call it a trail, but if you carefully head down hill from the 34.28 road marker, you should get these views. 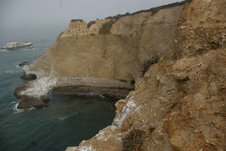 However, it’s a lot safer to just look at Picture # 6418 on the California Coastal Records Project. Our descent, now a practiced routine, was uneventful through its most dangerous stretch. 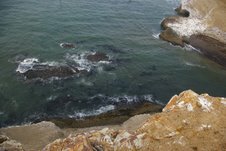 I had relaxed and was chatting as we negotiated the last part, a rock spine just above the waves, when it happened. I stepped on a loose rock, my feet shot out from under me, and with arms flailing, I gracelessly and painfully sat down hard on the only part of my body that’s stayed as scrawny as when I was young. Worse, my desperately-searching-for-something-to-grab hand smacked a sharp rock. With my heart rate and adrenaline level sky high, the blood began to flow freely from a small cut. As I’m massaging my insulted glute, I’m thinking, Great!? I’ve just become shark bait. Fortunately, with a short, calming rest, followed by the time when we were suiting up, my excellent clotting skill had prevailed, and we were set to go. But, Neptune was ready for us. He sent a set of the biggest waves I had seen that morning crashing into the cove, lining it, rocky- shoulder- to- rocky- shoulder, with an unbroken wall of whitewater. While we were waiting for the set to pass, Larry noted that the water spilling through the Acid Beach Arch was nowhere near as turbulent as the main cove. He suggested we try that. Oooh, while swimming in a narrow, rocky tunnel while waves are crashing through it, is a little too reminiscent (for me) of being in a railroad tunnel when a train comes zipping through. Larry’s observation was correct, and the lure of a little manageable danger, while truly experiencing the arch, decided the issue. Gingerly picking our way along the shore’s slippery rocks, bracing ourselves every time a wave slapped at our knees, we closed in on the arch and entered the water. Everything was proceeding nicely as we “boogied” into the arch. The risk, the sea level view of the arch cavity’s interior, the symphony of the surge, its echoed slap as it bounced off the rocky walls, and knowing we were one of the very few people ever to experience this phenomena made me giddy. My reverie was broken, however, by a roar when a large wave broke at the ocean end of the arch’s opening and filled the tunnel with a wall of whitewater. Larry, leading the way ten feet ahead of me was propelled backwards, ending up five feet behind me when it had passed. Suddenly, realizing this wasn’t a place to hang out at, we started to kick frantically oceanward. Seconds later another large wave came in and took back any progress I had made. Then another. What the hell was going on? I wasn’t making any progress. It was then I realized what was going on. I was caught up in a riptide kind of situation. The waves were entering the arch, but the water they brought was flowing into the cove and exiting through the main channel. I was essentially trying to swim upstream. Realizing a really big wave might come at anytime and keelhaul us along the tunnel’s encrusted walls, I redoubled my ineffectual efforts, and after what seemed like way too long a time, I followed Larry into the open air. With a mutual Wow!, we turned and headed north. But, my problems were not over. While Larry pressed forward smoothly, I just seemed to wallow like a rudderless ship in troubled waters. I’d like to think, the fact that my boogieboard was indeed rudderless (thanks to the mysterious disappearance last year of its skegs) was the main problem, but I think there was another more important factor. The “water baby” part of my psyche, born and nurtured during my youth as I surfed and swam in the waters of San Diego and Hawaii, had grown old and decrepit, just a pleasantly delusional bit of nostalgic pride I still held to, or so it seemed. Nevertheless, after experimenting with my hold, and positioning on the board, as well as kicking styles, and eventually adding my left arm’s strokes to the struggle forward, I eventually joined Larry, already on “The Notch’s” beach. 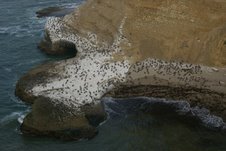 And was immediately, greeted by the powerful stench from the guano, left by the storm of birds that had gone aborne as we approached; its deposits whitewashing every rock in sight. Still a grinning high five was exchanged, and we began to reconnoiter our newly claimed land. Not much to see, even in the way of marine debris, and even the sand was covered with a coating of bird frosting. We searched the one small cave in the cliff face, its opening festooned with hanging plants kept alive in this hostile environment by the fresh water leaking from cracks above it. We didn’t find any buried treasure, at least that we’ll admit. Satisfied, we climbed out on the promontory that shelters the cove to the northwest, checked out the arch to the north and jumped off into deep water. Knowing that the Longshore current would be working with us on our return swim south I started to relax. Especially, when I saw a harbor seal curiously following us a little further offshore. It was probably the same one that had grudgingly slipped into the waters of Acid Beach, and watched us for several minutes when we had first arrived. I’m thinking, while my fish-out-of-water floundering makes me easy pickings, an extremely well-marbled seal tartare, encased in a thick wrapping of blubber, should be more appealing to all but the most incompetent of hungry sharks. As we kicked south, I was just starting to calculate which side of the cove’s main opening to use in my approach to Acid Beach, when Larry surprised me by stopping in front of the Acid Beach Arch. challenging me with the suggestion of, “Just for giggles, let’s go back through the arch.” With some hesitation I agreed and turned and headed in to where he was, Before Mr. Pokey, that’s me, could get there and before he could enter the opening, a large wave lifted me, passed by, and crashed into the tunnel, bounced off a projection in the wall and sent a three foot wave foaming across to the other wall. Wide-eyed Larry turned and made what I considered an eminently intelligent suggestion, of, “Maybe we should go around? Things went smoothly, if still remarkably slowly for me, from that point. Larry was already standing on the beach by the time I got into the break zone at the cove’s main opening and got to watch my unsuccessful efforts to catch a wave on the way in. When I finally got to the beach, dragged myself up the rocks and tiredly dropped on my sore rear-end, I unknowingly let out a sigh so loud, Meg told me later, she’d heard it from the clifftop, even above the noise of the surf. They say mistakes are better teachers then successes, so I’ll reflect on mine for a while. But, rest assured, when we return to get to know this area better, and take video of our passages through all seven arches, I won’t be wearing my kayaking life vest, won’t be using a boogieboard, but I will be wearing my fins and mask. But, most importantly, I’ll face up to the fact the “water baby” is long gone, leaving an out-of-shape water geezer, who needs to be more careful lest he become crab bait. Enjoy. John. This entry was posted in Russell Towle, Uncategorized. Bookmark the permalink.